Every year my mom and I decorate gingerbread houses. We have since I can remember. Its a tradition that I love. Some years they have been silly, some years we used store bought forms, some years we made homemade gingerbread for the house and some years we try to be pro 😜. Starting three years ago we started a new way of making “gingerbread houses”. We started using pretzel rods to create log cabins. It is so easy and they have turned out so cute. Here is my finished log cabin Christmas house for this year! It’s always fun being creative and coming up with what I am going to do year to year. 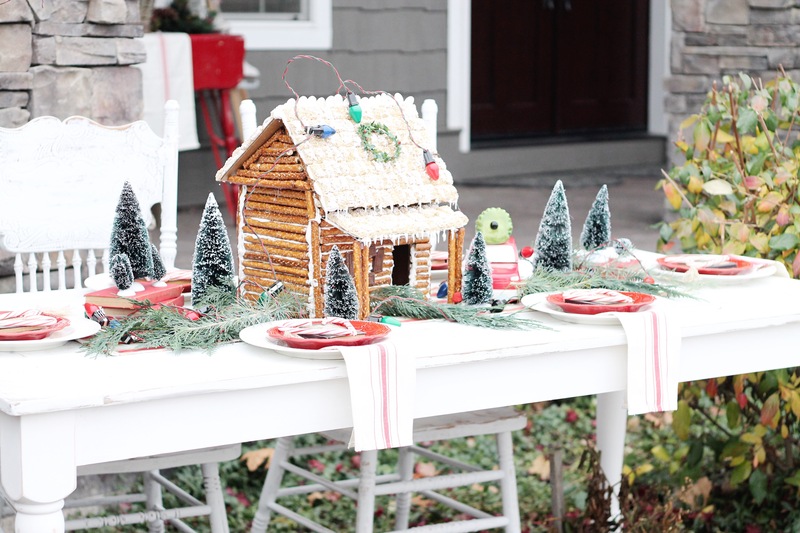 We thought we would share our fun tradition with you all and show you how we create these houses. My first step was to search for house design ideas that I liked on Pinterest. This is something I do throughout the year. 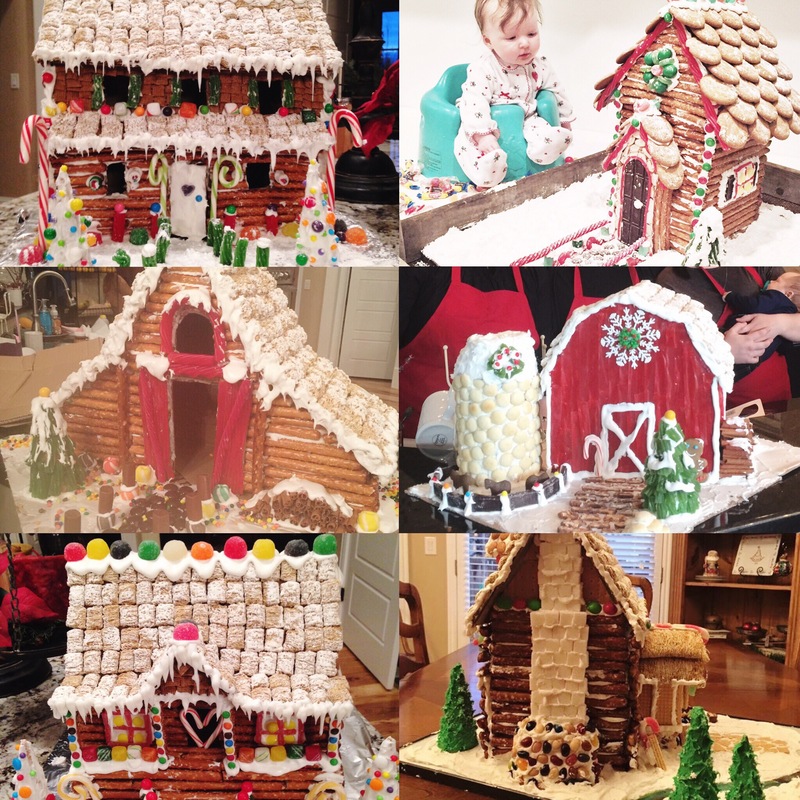 When I see gingerbread house designs I love I pin them and when it comes to gingerbread making time I look at all my ideas I have saved. It then makes it easier for me to decide which I want to do. This is a spin off design of one I saw. Once you have your design ready you will want to make the house out of cardboard. I started with the front of my house. I wanted to have the little pitched roof in front so I made sure to include that. I first drew it on the cardboard then cut it out with heavy duty scissors. I traced this same piece for the back of the house but left off the pitched roof piece. I then cut out two sides that were the same height as the front and the back. I then glued these four pieces together with hot glue. I still needed a roof. I held up cardboard to the house and guessed about what size I would need. I cut two identical pieces. I made sure to notch out the roof where the roof will hit the front pitch of the other roof line. See the picture below. Glue the roof on. I then cut out a roof piece for the small pitched roof. I just guessed. I used a piece of cardboard that had the bend in it. As you can see it doesn’t fit perfectly which is fine because I will cover it with candy! Now is for the fun part. You first want to cover all the house with pretzels. To attach them place some glue on the pretzel and glue it on the house. Then you will want to pipe on a row of frosting. This will look like mortar in-between the “logs.” Here is the royal icing that we use. It is a royal icing frosting that will turn as hard as a rock. Perfect for a house you want to keep up all December long. This is my moms house. She decided to cut a hole for her front door. You can do the same if you want. I decided to use a Hersey bar for my front door so I just left that blank and didn’t cover it with pretzels. The next major step is to decide on your roof. My mom used frosted mini wheats on her roof which gave the look of a snowy roof. She just hot glued them all on the roof. You can start to see our mess. To be honest we are really messy crafters haha. Just come see our house when we finish a project like this. For my roof I used white chocolate candy melts. I found the idea on Pinterest and loved it! Since mine were chocolate I didn’t use a hot glue gun to attach the candy melts. I used the frosting. I just piped on a strip of frosting and did a row at a time starting on the bottom. I forgot to take a picture of my roof while in the process but here is the finished product. Now if your house is all covered with candy or pretzels you are ready to decorate with candy and do the finishing touches. I still needed to finish the front of my house. In the pictures below you can see that i didn’t do logs across the whole thing. I wanted to fill this area with the door and faux rock. I started by adding the front door. I cut a rounded top on a king size Hersey bar. Then added frosting and stuck it on in the center. Next I piped frosting all around the door and logs and stuck on slivered almonds. I forgot to take a picture of this process as well but here is the finished product. Alright, my cardboard house is now completely covered. Now is the time we decorated and added candy touches. I went simple this year. I wanted it to fit with the theme of my christmas decor this year of red and white. I added windows out of the frosting. I broke candy canes and placed them under the windows. I then made a red wreath out of gummy melon slices. I cut it in half to create a circle and did the swirl design with frosting. The last thing I added were candy raspberries to the top of my roof. My mom added a wreath and some chocolate bars for windows. We both decided to keep it simple. You could obviously cover the whole thing with candy if you wanted. We both added ice cycles with frosting along the bottom of our roofs, faux trees and sprinkled them with powdered sugar to give the effect of snow. Here is my moms completed. She set hers up as a centerpiece of a christmas table setting. She placed that red car found at target next to the house. Spread greenery around and added little trees. She also strung a set of old vintage christmas lights across the centerpiece. It turned out to be the perfect centerpiece. Here is mine completed. I added mine to our coffee table… If you know me, you know I have a toddler so this didn’t stay here long. I loved how it matched the colors of our living room. It’s now sitting on our kitchen counter. We added a collection of pictures from the past few years of the houses we have done. Last year we had a gingerbread house making party and invited a few friends. A couple of these houses are theirs as well. 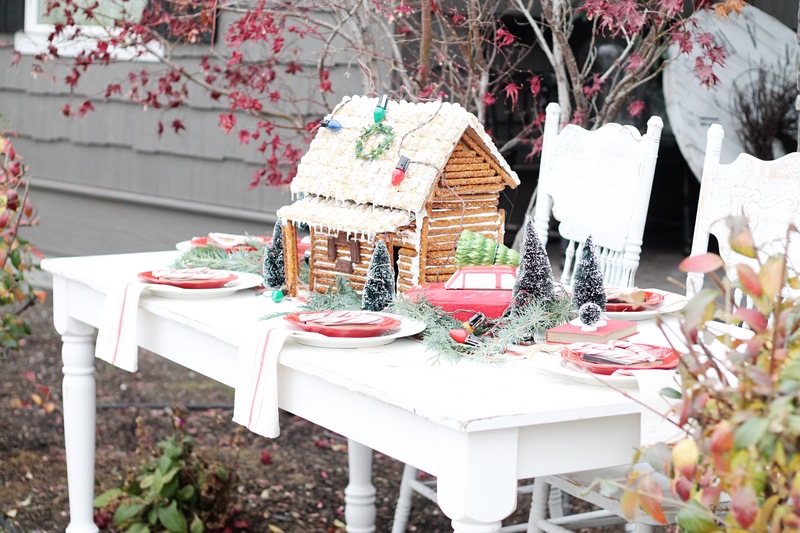 Hope we can inspire you to make your own creative log cabin Christmas house. 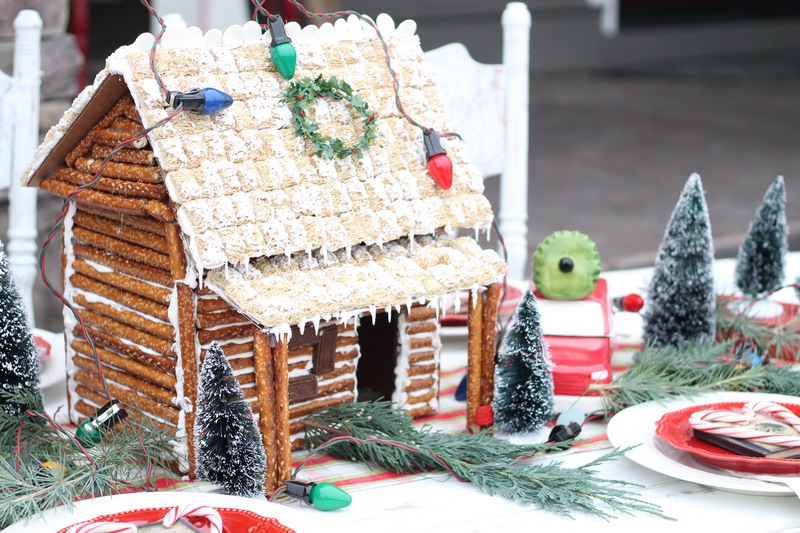 With just a few weeks left until Christmas you still have time to make your own Christmas log cabin. Once again we hope we inspired you to be creative. Tag us in your houses so we can see your awesome work! I love your houses. Thank you for sharing. I am going to get supplies to build my own. Hope you have a very Merry Christmas! This is the most beautiful gingerbread house I’ve ever seen! Wow!